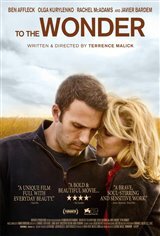 After visiting Mont Saint-Michel, also known as the Wonder, at the peak of their loving relationship, Neil (Ben Affleck) brings Marina (Olga Kurylenko) back to Oklahoma with him to be his wife. But the relationship doesn't work as they imagined it would and the marriage falls apart. Neil finds himself reconnecting with a woman from his past (Rachel McAdams), his childhood love, while Marina befriends a priest and fellow exile (Javier Bardem) who's struggling with his vocation.